More snow photos, forgive me. I just couldn’t help myself. When I got up this morning there was a lovely white fluffy blanket of a couple of inches of the stuff spread across the ground and just about everything else. The first snow we got was just a sprinkling, a hint of what was to come. Today’s snowfall was our first significant accumulation. Since everything looked so lovely, and the sun was out and shining brightly, I decided to walk to my usual header-photo-taking spot halfway along the field immediately behind the house and get a new seasonally-appropriate image for the blog. 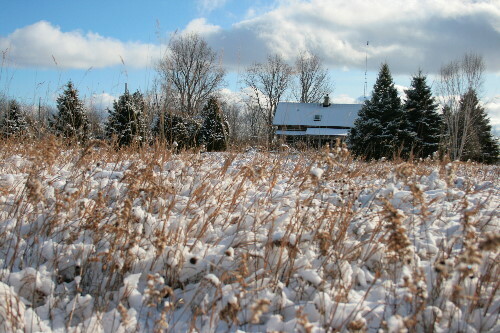 This will be the blog’s header image until winter really settles in and we’ve accumulated enough snow that you can’t see much of the grasses anymore – late January, perhaps. 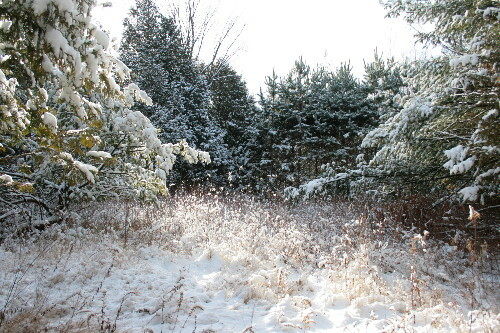 A photo of the front yard, with a smooth white frosting, as taken from the living room windows. Dan’s poor boat, with nowhere to float these days, sits overturned in the same place it’s been since we moved in in July, tucked against the foot of a spruce. I really like that we’re surrounded by so many evergreens. This photo looks down toward the road, not that you can see it. The owners, many years ago, planted the spruces (and, farther beyond, the pines) as a privacy screen when the neighbours started building their house. They do a great job. They also look stunning draped in snow. Snow on spruce boughs has to be one of my favourite winter sights. Snow on pine boughs runs a close second. 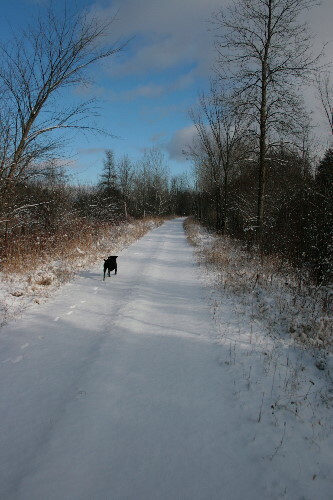 It was too pretty to just walk back for the house photo, so I decided to take Raven and hike to the back field, and admire the snow. Raven was up for that. She’s always up for a hike. You comin’, slowpoke? She has great fun in the snow. 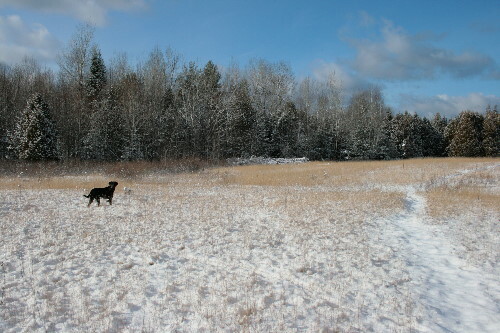 Her favourite thing is snowbanks, which she loves to roll around in like those playful ravens, her namesakes. (We didn’t really name her after the playful ravens, just ravens in general.) But just dashing around, snuffling at footprints, that’ll suit her, too. The sky was such an incredible, rich blue. There’s something about winter that really brings out the blue of the sky. Is it simply that it has no other colours to compete against? Midway back, a group of cedars. 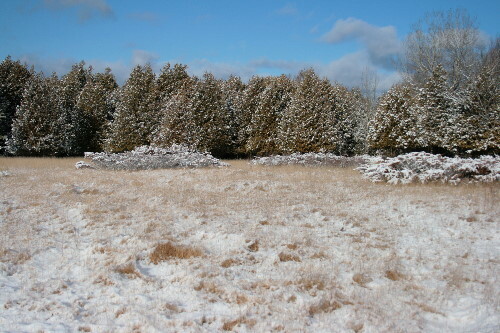 Number three is snow on cedar boughs. Actually, I think this little grove has a little bit of everything in it. And then we reach the back of our fields. At the very back there’s a large section of wet ground, almost bog-like, filled with cedars and sphagnum moss and a few tamarack. 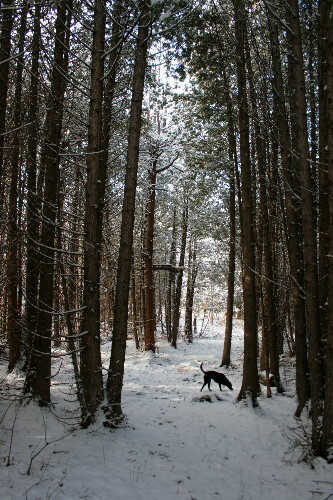 The cedars form dense groves through the wet bits. Led on, perhaps, by the beautiful scenery? I had planned only to go as far as the last field, but when I got there, I decided to push further, to the back fenceline. The wet areas would be frozen, which was my main deterrent for going through there in the warmer months. It would be nice to have a little boardwalk to cross through without stepping on vegetation or getting your feet wet. 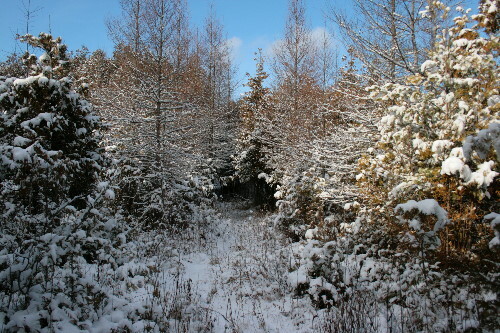 The evergreens through here all look so pretty with the snow adorning their branches. Very tall cedars where the ground dries out a bit more. It’s funny how even though the trees are the same species, the grove can have a completely different feel. Despite the closed canopy, the ground still has a layer of snow. I get to the fenceline, just beyond. And… I’m not ready to turn around and go back to the house just yet, despite that I didn’t wear my longjohns. Perhaps just a short ways down the rail trail that abuts the back end of the property? Yes, I think so. 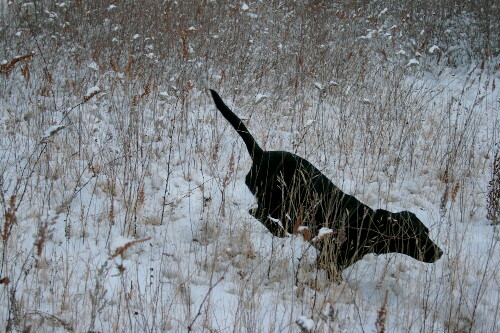 Maybe I’ll walk down to the stream and come back… Raven thinks this is a great idea. That looks lovely. We probably won’t get a snow like that for a few more weeks. Maybe you’ll get some crossbills in those spruces. I’ve got my fingers crossed, John! I would also be open to Evening Grosbeaks, which supposedly breed in the area. It’s been years since I’ve seen one. Thanks, Jason. It is a beautiful time of year – but then, I could probably say that of nearly any season. Hopefully you’ll get some snow of your own, but I’ll be happy to provide regular snowy updates in case you don’t! gorgeous pictures! i like how raven got in on the new header picture:) and i can’t believe i’m saying it, but i really wish it was snowing today…it’s a rainy miserable day in st. catharines…just gross. Thanks, Karina! She’s a weasely one, that pup! 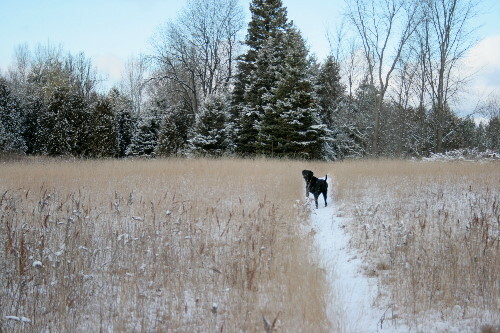 Actually, I posed her there and she reluctantly stayed even though she really wanted to romp around in the snow. I heard that further west of here there was actually a fair bit of rain happening. We never saw any of it, it all fell frozen. 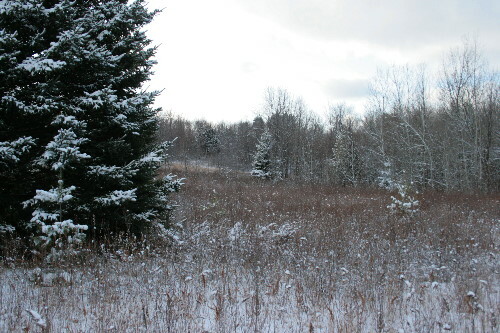 We just had our first snow as well – not as much accumulation, and not as pretty in consequence. And our cat’s having no part of it, unlike Raven. Hee. I’m not sure how our cats would take it, either, Wren. Yesterday we had quite the snowstorm, and even Raven, usually gung-ho for snow, decided it was nicer inside by the fire.